During a programmed visit to Château Vartely Tourist Complex, with a tour of winery and wine tastings, visitors can discover and experience the history, traditions and culture of winemaking in Moldova. Hidden inside of a limestone hill, the winery cellars benefit the most from the stone’s natural property of maintaining the cool temperature. Here, visitors can enjoy tours and wine tastings accompanied by the professional guides. In this respect, the tasting rooms of Château Vartely ensure ideal conditions for a true wine tasting experience. The grand tasting rooms houses a collection of the winery’s own wines. The second tasting room presents a collection of wines from the major wine regions of the world. After the wine tasting visitors can enjoy delicious meals of Moldovan traditional cuisine, served at the restaurant of the Château Vartely tourist complex, and, if desired, extend the stay in one of three gorgeous villas. So, any visitor has the opportunity to stay in one of three guest villas. There are options for accommodation of one guest, two guests / double bed or a VIP – suites. Each option has breakfast included. The prices vary from 60 to 110 euro per room per night. More details about accommodation services see on the hotel dedicated page. Included services: transport, guide, tours and tastings. Along with the top quality tourist services, the Château Vartely Complex also offers a conference room with modern equipment. The facility is suitable for training sessions, teambuilding activities or summits. The restaurant can accommodate events for up to 160 seated people. It is equipped with a modern equipment, A/C and sound system. In addition, the hotel terrace can be used for any larger event or special occasion that you may choose to celebrate with us. 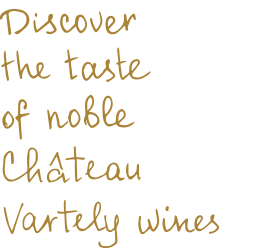 And if you fell in love with a particular wine, the Château Vartely brand store, located right at the gates of the tourist complex, offers a full range of wines and souvenir accessories. It is a perfect place to do a special shopping. The Château Vartely Winery and Tourist Complex stay open to visitors all year round and is happy to share the very special moments in its guests’ life.